In the next set of articles I’ll discuss about the preparations surrounding a safari trip. There are all sorts of considerations that could either make or break your safari adventure. It can really help to understand what they are, which ones may apply to your specific situation and expectations, and what to do to complete the preparations in time before your planned trip. It all starts with understanding what you want to get out of your own safari journey. Are you happy to just tour around? Do you like to take some snapshots perhaps with your mobile phone or (one step up) your pocket camera? Or are you an enthusiast nature photographer or even professional with a serious set of camera gear you need to have in close reach to catch that once in a lifetime shot? Once you’ve figured out the answers to these questions (shouldn’t be too hard… :) you can think about the items of your trip that merit some investment (time/money or both) to get them completed in time. For example, if you’re happy to cruise around in a minivan for a day or 2, simply choose from the hundreds of tour operators in the Mara and you’re practically on your way. In my case, I was looking for the right tour operator (photography), the right accommodation (small/boutique), the right transportation (large land cruiser with enough room to put my gear) and the right driver. Of all the factors that contribute to a successful safari trip, your driver may be the most important one: I knew I needed both a good driver and a guide who knows the Mara for spotting wildlife, who knows about photography to position the vehicle at the right time and right angle, and who knows about people and has the social skills so you can perform as a team and have fun along the way as well. …Easy, right? :). Nikon 600mm f/4E FL on Nikon D850, f/4, 1/2000 s., ISO 110, -0.3EV exp. comp. My own preparations took me about 4 months, and while I had figured out what I wanted to achieve, finding the right tour operator was a different story all together. Of all the minivans and land cruisers I’ve seen in the Mara, I’d say only 3 or 4 were actually fully geared for nature photographers. The majority of vehicles catered for the ‘enthusiast’ safari tourist with photography gear ranging from mobile phones, tablets, consumer/prosumer DSLRs and mirrorless, up to the very few with the pro DSLRs and big glass. Looking back, I’m happy I did spend the time looking for that right tour operator and as I mentioned in my previous article, I’m aiming to organize a similar safari trip in the near future (this year) for a small group of photography enthusiasts. This series of articles has yet to start but I have already received some reactions from some interested readers, so this is starting to look better each day! If the stories and images strike a cord in the coming weeks… drop me a note at: enquiry@fliek.com and we’ll take it from there! 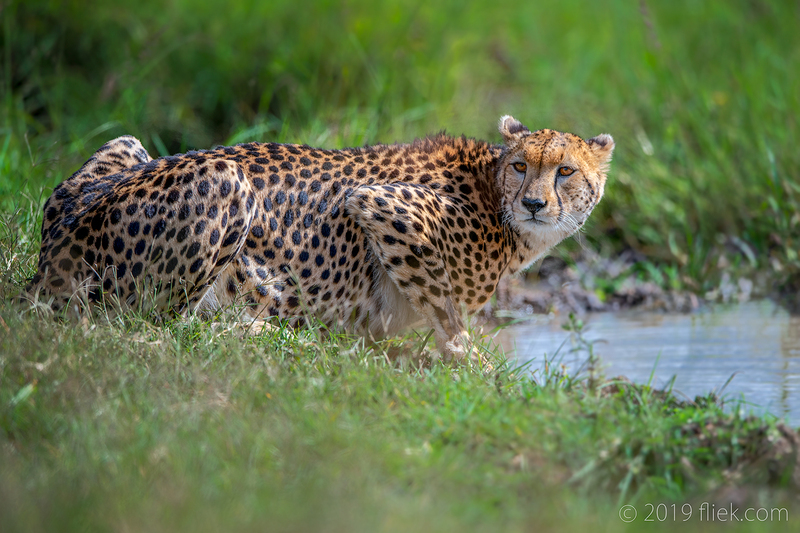 In the next set of articles I’ll post some more cheetah shots while talking about gear (“what’s in the bag”), clothing, accommodation, and anything else that comes to mind to ensure a successful safari journey… And I’ll make an effort to keep those posts coming. Stay tuned!